Hey guys! 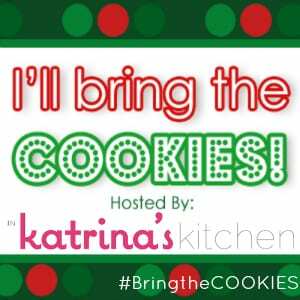 I’m excited to be back for my third year of I’ll Bring the Cookies! This is my favorite blog event of the year and I have to say, I was pretty sad a few weeks ago when I thought I hadn’t been invited to the party. Lucky for me though, I got a message from Katrina a few days later wondering if her invite had been sent to spam. Anyway, I am Amanda and my blog is Fake Ginger. It’s mostly food. And I talk about my dogs a lot. That’s pretty much it. Pistachios are kind of my thing this year. Pistachio ice cream, pistachio pudding, pistachios on salad. I am all about the pistachio. Back in the summer I had a full miserable week of tiny cuts under my nails from a pistachio eating session that lasted way longer than it should have. It was bad. I have since learned to buy the already shelled pistachios. 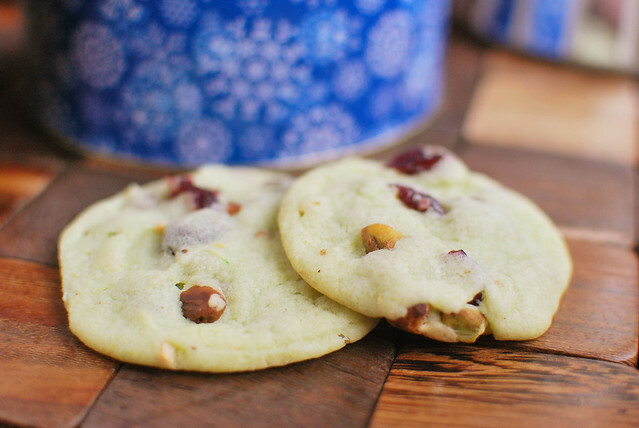 If you love pistachios like me, you must try these cookies. 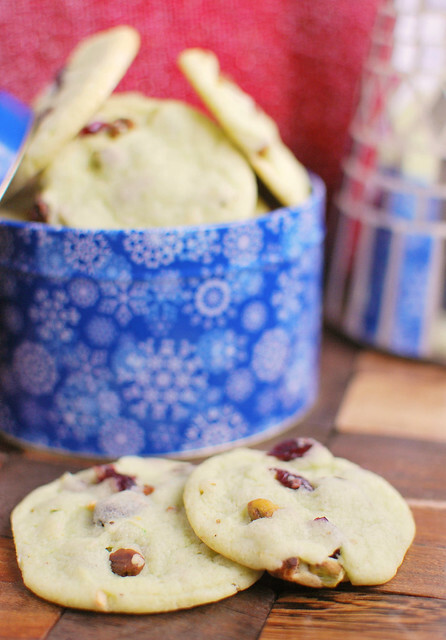 Salty pistachios with sweet sugar cookie dough and tart cranberries? Come on. Is there a better combination? My kids usually refuse to eat cookies with nuts but these were a hit with all three of them. Salty pistachios with sweet sugar cookie dough and tart cranberries- pretty much heaven. Whisk together sugar cookie mix, pistachio pudding mix, and flour. Don't worry about clumps. Add butter and eggs. Use an electric mixer to beat until combined, about 2 minutes. Use a rubber spatula to fold in pistachios and cranberries. Bake 9 - 11 minutes or until the edges are a very light golden brown. Cool completely on a wire rack. This post is part of our Third Annual I’ll Bring the COOKIES Virtual Blogger Cookie Swap. Be sure to check back here every day in December leading up to Christmas where some of the best bloggers will be sharing their favorite cookie recipe! You can also follow along Facebook, Twitter, Instagram, and Google+ with the hashtag #BringtheCOOKIES. Thank you to OXO for being our exclusive #BringtheCOOKIES sponsor. Be sure to visit Amanda’s blog, Fake Ginger to enter a sweet OXO Baking Prize Pack. Love everything about these cookies, except the fact that I don’t have one in front of me right now! Wow, wow, wow, I just love the marriage of salty and sweet and in these cookies you’ve got tangy in there, too! This recipe is going in my Christmas cookie line-up this year! I’m with you…I love a sweet and salty combination…and pistachios? YES! Love them….and they are so festive with those red cranberries! You’re a magician…I just know it!! These look fantastic! Oh my gosh!! 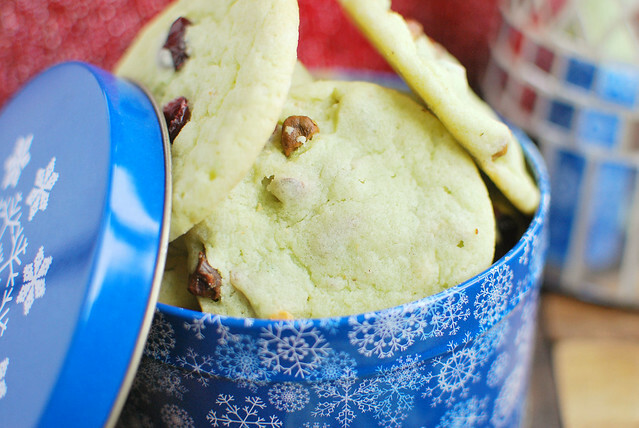 Pistachio/Cranberries is one of the BEST combos on Earth and I am stoked that you put it in a cookie!! Loves it! Would love to try the gingerbread madeleines. Got really excited about making these cookies for the New Year, then on reading recipe realised we don’t have Sugar Cookie Mix or Pistachio Pudding Mix here in Australia. I love this recipe and tried it and it came out ever better than I expected! My kids absolutely devoured it so thanks alot for sharing this recipe and your wonderful pics.